In one of my previous posts on the topic of risk, I mentioned studies that show that investor tolerance for the stock market risk is much higher when the market is rising than when it is falling like a knife. It turned out that the risk is felt as something abstract until you actually start losing real money, at which point it becomes painfully real and risk appetite-suppressing. I was reminded of this phenomenon as I was researching material for this blog post, and unintentionally encountered the risk of depending on Open Source projects. The post was supposed to be another one in a series about our journey into full-on Node.js development. I wanted to demonstrate one of the key selling points of Node – the ability to handle a lot of I/O in a non-blocking fashion, allowing the Node server to push simultaneous messages to a large number of clients using one of the push technologies. As with everything Node, there are multiple libraries for this task but it is hard to miss that Socket.io has been immensely popular among the choices (here is a nice summary of the server push choices for Node.js). Allright then, let’s install socket.io via NPM and start coding. Not so fast – which version? And herein starts a tale full of twists and suspense. If you go to Socket.io Web site, it is all about version 0.9. Aha, but if you google Socket.io, you will find presentations of the type “Why Socket.io 1.0”, “What is new in Socket.io 1.0”, “How Socket.io 1.0 Will Be Unbelievably Awesome”, all around mid 2012 or so. Then in 2013 – silence. Everybody assumed it was a matter of days until 1.0 appeared, yet we are still waiting. It looks like version 1.0 has been a long time coming, which is fine by itself – I have noticed that Node community favors features and quality over schedules (all these comments equally apply to Node version 0.12). However, there is precious little about the upcoming version at the project’s GitHub home page. This has caused a lot of discussion in the project itself, as well as a panicky Google Groups thread Is Socket.io Dying? Well, it appears that rumors of Socket.io’s death have been greatly exaggerated – Mr. @rauchg himself appeared to assuage palpitating followers and assure them that all test suites for v1.0 are passing and the good news are coming very soon. This was in December 2013. We are in February 2014 and still waiting. The lower level Engine.io module is supposed to power Socket.io, and apparently that’s where most of the action is these days. The frustrating wait for a long anticipated product is something I have experienced recently with Apple Logic Pro X. Apple’s replacement for the Logic Pro 9 was several years in coming, and the rumor mill was crazy. People were latching to every whisper on the InterWeb, every Mac Rumor they can find, publicly renounced Apple, threatened to switch to Cubase or Pro Tools. The parallels are almost uncanny: uncertainty about the next version, tight-lipped product owners leaving a lot of room for speculation, FUD, rumors of near death, reassurances by the product owners that they are ‘hard at work on a new version’. In the end the new version did arrive, it was unbelievably awesome and everybody was too busy playing with it and loving Apple again to remember how crazy they were only a short while ago. Most likely this will be Socket.io story – @rauchg and the team will be forgiven as soon as NPM starts serving v1.0 modules. What did we learn from this, if anything? Google Groups comments contained reminders that “Socket.io is Open Source, after all”, and that “we should be grateful for free software” and “they don’t owe you anything, man” etc. All true, but I take an issue with “free software”. Open Source software is not very different from paid software – there is always a reason why somebody writes it, and the fact that I am not asked to pay for the software upfront does not mean that a business model does not exist and that a transaction is not happening. It is just not as obvious as with payware. Open Source is free, but it is not a hobby for most people. In the old days, releasing code into Open Source was a way to undercut a competitor by commoditizing a function or a product. More recently, contributing to Open Source became a way to grow your personal brand and be highly employable in the social economy. One of these days somebody will make the equivalent of the Klout number that measures your footprint in Open Source projects (you can call it ‘Codex’ but if you do, I want some stock options if you build a startup around this idea). Therefore, while Guillermo Rauch wrote Socket.io ‘for free’, social advertisers can calculate to a dollar the value of the tagline “Creator of socket.io” in his Twitter profile. Otherwise, how on Earth can Snapchat that makes zero revenue be valuated at $3B by Facebook, and then turn down that offer? Not seeing the monetization path right away does not mean it does not exist. Apart from individual contributors and their public brand, whole companies build up their street cred by contributing to Open Source. In a recent article by ReadWrite (thanks for passing along, @cra! ), companies such as Google, Twitter and LinkedIn were open about it. In fact, LinkedIn went as far as to claim that ‘Open Source is part of their recruiting strategy’ because their engineering blog and the code that is discussed there is essentially a replacement for the HR lady (unless you consider Veena Basavaraj a member of LinkedIn HR – it definitely seemed so when I researched their fork of Dust.js: I felt the urge to work for LinkedIn, and I wasn’t even looking). 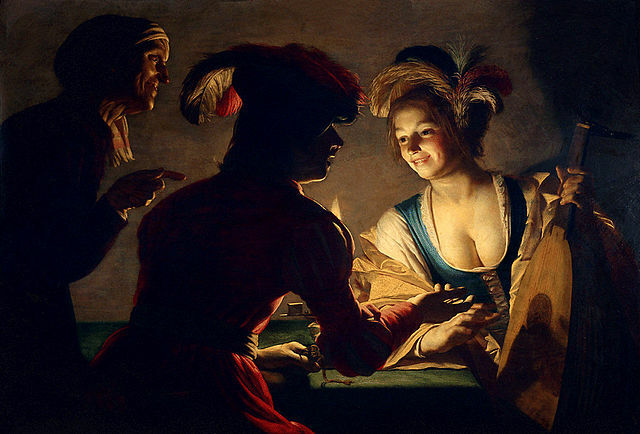 In a sense, GitHub is becoming the software industry equivalent of that matchmaker lady in the painting above, matching companies on a lookout for talent and developers putting their best lines of code forward. Your ‘free’ GitHub project may speak about you more than your LinkedIn resume. For some developers, Open Source GitHub projects ARE their resumes, cutting the glib ‘team player’ and ‘fast learner’ claptrap of traditional resumes that nobody reads and going straight to the code, where the tire meets the road. It is all great that you work well in response to challenge, but why don’t you fix those 150 issues that are gathering dust in your project? Will you be similarly neglectful if we hire you? In that light, I don’t think it is too much to ask to get the Socket.io v1.0 out the door already, particularly after so much PR about it. Every time we tweet about it, use it, write articles and blog posts, talk to our friends about it, we build up the Socket.io team’s reputation they can take all the way to the bank, so I think the transaction is fair and we are even. Along that line (and to tie back to my reference to risk tolerance, in this case risk of building production code on top of Open Source software), I don’t think we can just wave our hand and say ‘it comes with the territory of using software you didn’t pay for’. As I tried to prove here, I DID pay for it and continue to pay, just in a more convoluted and delayed transaction. Less pontificating, more coding. Next week I will go back from this tangent to write about pushing events from a Node.js server using whichever Socket.io version is available at that time. Maybe this blog post will code-shame them into releasing v1.0.